U of R students and faculty members stand outside the University of Aberdeen after meeting with Scottish counseling students and professors. Shown here are (left to right): Nora C. Alvarez-Padilla ’19, Professor Rod Goodyear, Katherine Paul ’19, Kayla R. Daniels ’18, ‘20, Professor Conroy Reynolds, Kailey M. Crabtree ’19, Alyssa N. Dialynas ’19, Jaclyn M. McCready ’20, Christina Lopez ’19, and Naoje S. Williams ’20. How are the counseling services provided in other countries different from those in the United States? What are the key differences for the counselors providing care? A University of Redlands graduate course called Counseling in a Global Context, part of the Clinical Mental Health Counseling program, aims to address these questions and expose students to a cross-cultural understanding of counseling. Each year, a different professor in the School of Education picks a destination that fosters new perspectives on mental health and counseling by facilitating conversations between students and their peers in other countries. Reynolds was particularly captivated by the country’s history of conflict and its role as a source of soldiers to fight in various wars, both foreign and domestic. The Scottish idea of manhood has been historically linked to their bravery and courage on the field of battle. But, Reynolds questioned, how has this history influenced their current mental and emotional states? 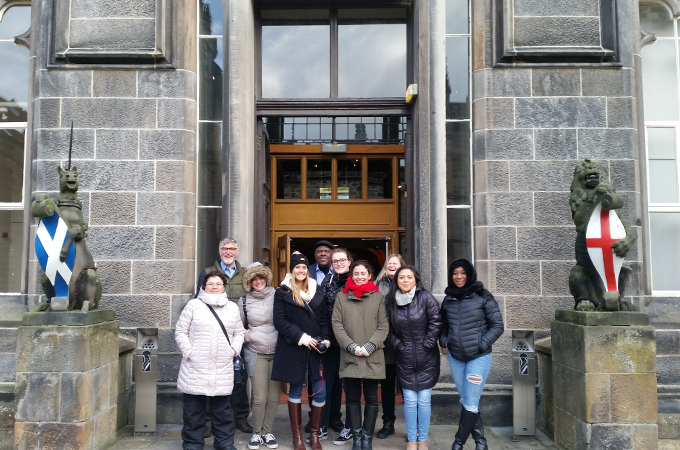 During the trip, the group visited the University of Edinburgh, where they met with faculty members and students to discuss counselor education. Also on the agenda were visits to the University of Aberdeen and a number of community-based mental health agencies that serve the country’s population. In addition to observing academic and healthcare environments, the group also visited natural and historically important sites. Every day brought new opportunities to experience the wonder and mystery of Scotland. Group members visit Edinburgh Castle, a fortress dating back to the 13th century, in between clinic and university visits. Pictured here (left to right) are: Katherine Paul ‘19, Janelle N. Beltran ’20, Kayla R. Daniels ’18, ’20, Jaclyn M. McCready ’20, Christina Lopez ’19, Alyssa N. Dialynas ’19, Naoje S. Williams ’20, Kailey M. Crabtree ’19, Erica E. Medina ’19, and Nora C. Alvarez-Padilla ’19. Over the course of the trip, Reynolds notes, the cultural and clinical differences surrounding mental health treatment in the United States and Scotland became apparent. “In Scotland, counselors generally do not have the exposure and respect of other mental health professionals, such as psychologists,” says Reynolds. Students who embarked on the trip were also struck by how their schooling and preparation to become counselors differed from their Scottish counterparts. Students in Edinburgh and Aberdeen described a Scottish curriculum based on psychodynamic and person-centered approaches, rather than the more eclectic approach to counseling experienced by Redlands students. And no formal licensure process like the one in California was required. Another difference the students noted was the U.K.’s free national public health service—NHS Scotland. Although the service had the potential to make counseling more accessible, the organizational structure put the decision about whether or not to fund mental health counseling at all in the hands of psychologists and psychiatrists who are less inclined to support the counseling profession. “The motivations for entering the counseling field is often different abroad, as Scottish counselors are expected to volunteer and are paid little when working with public healthcare,” says Katie Paul ’19. “Alternately, students in the U.S. can usually independently support themselves financially while working full-time and are taught an array of theories that enable them to make diagnoses.” Counselors in Scotland do not diagnose mental illness. 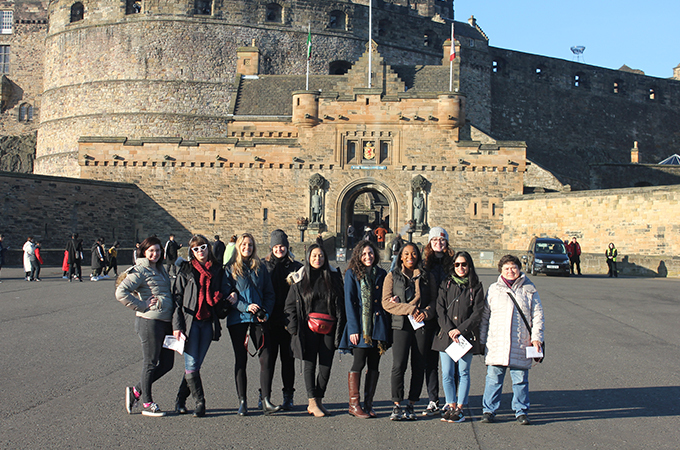 Visiting Scotland gave students the opportunity to challenge their own preconceived understanding. Many students arrived in Scotland, a Westernized country like the United States, with the belief that the two countries’ mental health systems would be similar. What they discovered was quite different, and that, Reynolds says, proves the value of the course. Learn more about the School of Education and its programs.